Kim Dotto (left), Dean, Applied Research presenting winner for Applied Research to Andrew Miltimore (right), Aaron Redina (middle) for their entry “ElastoKers – Design and Development of a Kinetic Energy Recovery System”. What do a drum harness, pair of glasses, and a bike wheel have in common? 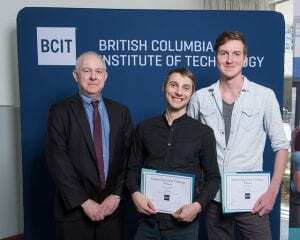 These were an inspiration for winners of the 8th annual BCIT Student Innovation Challenge! BCIT’s Student Innovation Challenge provides support, encouragement and funding to BCIT students who have “bright ideas”. Since its founding, the Student Innovation Challenge has inspired innovative and high-impact students and projects. 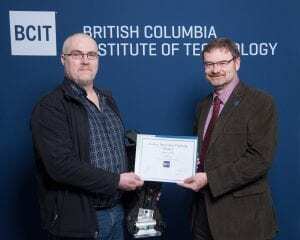 “Our judges come from across the Institute, including faculty, staff and the Student Association,” said Tom Roemer, BCIT Vice President, Academic. “This year we included a representative from the National Research Council – Industrial Research Assistance Program to assist us in picking the top product or service”. This year we were extremely happy with the quality and quantity of entries (dozens) submitted. In fact, the Applied Research category two entries where considered tied – one 1 point separated them from a 3,000 point scale. “We need to award two winners,” said Kim Dotto, Dean of Applied Research. “Let’s find the money somewhere to support these two innovative student projects”. 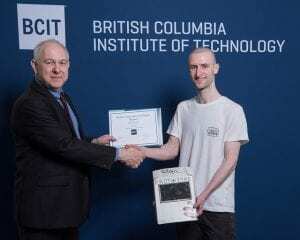 “Ganaan Drum Harness and Mounting System” at the BCIT Student Innovation Challenge to Tom Roemer, VP, Academic. 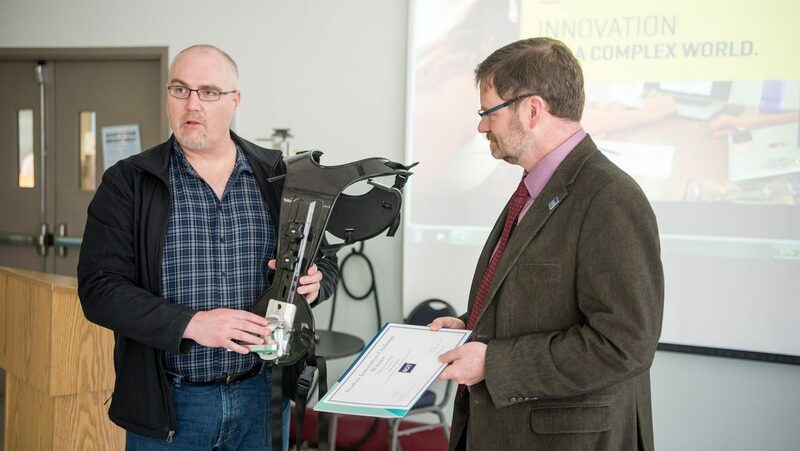 Garth Newlands took home the Entrepreneurship Student Innovation Challenge award for his Ganaan Drum Harness and Mounting System. Garth realized that marching band drum harnesses haven’t changed in more than 20 years. His new design introduces new materials and a design that simplifies the system as a whole. The drummer can get going faster in a more comfortable position. The Ganaan Drum Harness is the lightest system on the market. The Applied Research Award was shared by two entries: Spencer Clayton’s Targeted Darkening Eyewear Technology, and Andrew Miltimore & Aaron Redina’s ElastoKers. Spencer developed wearable targeted darkening eyewear. He took on the problem of excessively bright point-light sources, which can be visually and physically hazardous. For example, more intense vehicle headlights have made driving at night a challenge. Drivers can’t look away, though. They have to look into oncoming headlights which causes the their pupils to shrink, reducing accurate perception in low light. There are existing methods of brightness correction products, but they reduce light levels across the entire field of view—so they can’t be used in already dark environments. Spencer’s glare reduction system reduces light levels in select areas, which opens up the possibility to use the glasses in darker environments where light sensitivity is of utmost importance, such as Astronomy. Congratulations to the winners and the other finalists in this year’s challenge! We wish you success as you advance your bright ideas! In fact, BCIT President Kathy Kinloch sent along the following congratulations. View all photos from the 2017 Student Innovation Challenge Awards Ceremony here.